Update Apr 2011: This is an archived version of the original Wirify introduction. For all the latest on Wirify please visit Wirify.com. » Wirify Pro with OmniGraffle, Balsamiq Mockups, Microsoft Visio and SVG (for Adobe Illustrator and other applications) export functionality is now available. Interaction designers spend a fair bit of time creating and revising wireframes in the early phases of our online projects. 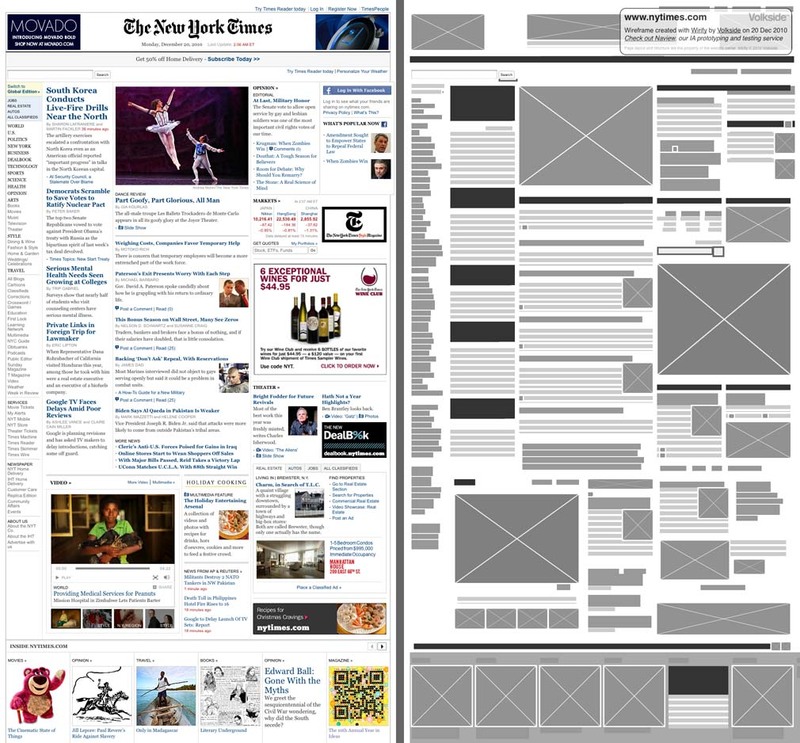 Whatever your take on wireframes is, they are a mainstay in the user experience professional’s toolkit. Although typical wireframes are essentially dead documents, they’re extremely helpful as thinking and communication tools during a project. We even have several great websites dedicated to sharing your wireframes and wireframing techniques with other designers. Still, wireframes are essentially a one-way street, a journey from the website concept and high-level information architecture to visual comps and ultimately real HTML, CSS and interactive behaviour. 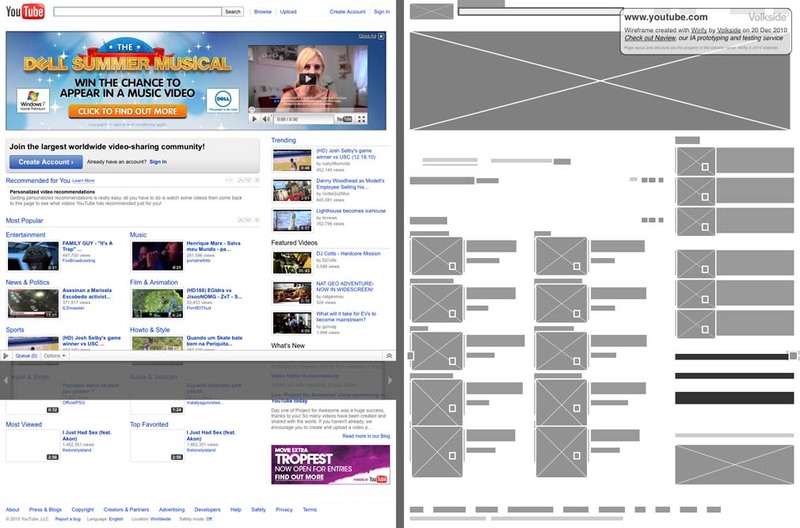 Once the site is live, you never go back to the wireframes. Until now. Wirify is created by Jussi Pasanen for Volkside, based in Melbourne. Follow @jopas on Twitter, view Jussi’s LinkedIn profile or read his bio. I loved the idea when I first saw it and like others thought it would be awesome to be able to de-word any website at a click. Wirify does that. This is the very first public version of Wirify and it’s still wet behind the ears. Keep us posted with your feedback or comment below and we’ll see if we can make it better! The next video shows a mockup of Wirify that allows you to control the level of detail between the original page and the wireframe. Would the level of detail control actually be useful in your (re)design work, or is it just a gimmick? I am not entirely convinced that the benefits outweigh the added complexity. Feel free to post your comments below or contact me on Twitter via @jopas or @wirify. Thanks again! Wow, what a fantastic response to Wirify on Twitter and elsewhere and it hasn’t even been 24 hours yet! Massive hat tip to all of you for trying it out!! All your feedback is most welcome, feel free to comment here or drop me a line on Twitter (@jopas). Future Wirify updates will also be available on Twitter (@wirify). Ps. I wanted to add that Wirify would not have been possible without jQuery, you guys are doing a fantastic job! Also big thanks to Tommy Saylor for his excellent bookmarklet article on Smashing Magazine. Incredibly, incredibly awesome. Very useful as a starting point for wireframes if you have a site you like and a client wants something similar (but overall different). Well done Jusi! It is an excellent tool! However it seems that it doesn’t work correctly in IE 8 and win 7. Also i would like to suggest making your promotional window a little more flexible so that it doesn’t messes up with the wireframe when making a screen capture. Finally i would like to make a suggestion for future releases. It would be nice to be able to turn on and off the HTML elements on the wireframe. Just wanted to share my thanks for this neat tool. I’ve been using it for making screenshots of sites, and then testing them at our usability testing service. I find testing wireframes like these is a really useful step in the process because users don’t get distracted by the content, and focus much more on the layout than anything. This saves me having to create wireframes for my testing and get’s them out there even quicker. So a big thanks, and merry christmas. If the determinants were clear, or even selectable, I would appreciate choosing the level of detail. Marcin Treder, the co-creator of UXPin paper prototyping kit, has posted an interesting take on Wirify over at UXaid: Wirify and the problem of wireframes without content. I have re-posted my response below. Thanks a lot for your post; it’s the most detailed commentary on Wirify I have received so far. As mentioned in my email I am not sure if I completely follow your first point above. I am assuming you’re talking about creating wireframes, something we UX people do on a weekly if not daily basis? 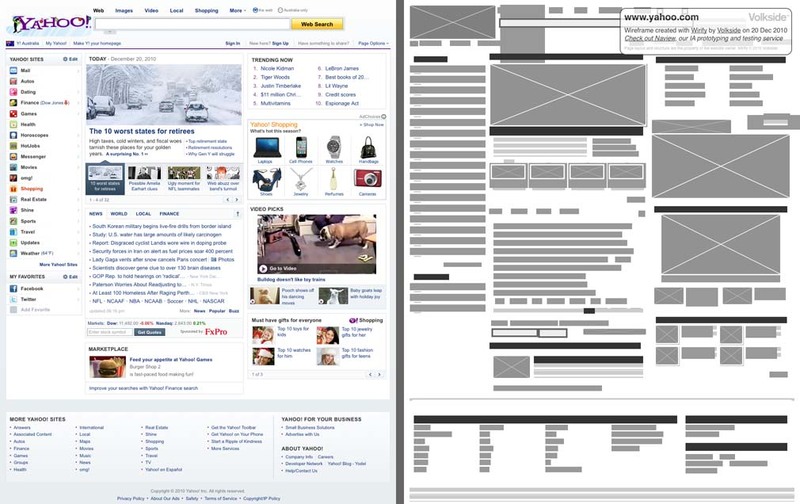 The main point of Wirify is not in fact the creation of wireframes at all, it is analysing existing page structures using them. All Wirify does is provide a slightly different perspective, which hopefully helps you notice new or different patterns by filtering out the “noise” of the fine detail. Wirify is not meant to replace any existing tools in the UX toolbox but rather supplement them. Secondly and most importantly – content is a vital point of any design, which just can’t be deleted. Using Aristotle terminology: design is only a form for the matter (using words of Aristotel;)) of content. This is a fair point and I fully agree that content is essential, and also that there is an interplay between form (structure) and content. The idea of "Web without words" is completely invalid. I can give you vivid example. I like your example but I’m afraid we are approaching this from quite different angles. A Wirify wireframe is not a replacement for the wireframes we normally create – it’s merely a filter you can apply on existing web pages. You can’t use Wirify to solve a design problem (no software can do that) but you can use it to help you see how others have solved similar or related problems. Have a look at Lee Munroe’s Checking Your Site For Visual Hierarchy and Paul Olyslager’s quick and easy ways to improve your website’s usability posts. They talk about the classic usability evaluation trick of using a blurred screenshot of a web page to see what really stands out and to analyse the visual hierarchy of the page. Wirify is an alternative version of this technique. I wonder if that would address some of your concerns about Wirify “deleting” the content? Jussi, thanks for the recognition above and in the comments of the .js file (Hope you don’t mind I peeked!). Wirify is a very cool little tool. Kudos! Definitely going into my bookmarklets folder! If I may suggest… It’d be nice if I could hide, minimize, or move your wf-info div. It’d also be super helpful if there were a switch or button to toggle back and forth between the original and wirified view, instead of just normalizing when clicking the page*. *If you do stay w/ this technique, I’d suggest adding cursor: pointer to the CSS to kinda alert that some interactivity will take place upon click. Hi Tommy, cheers for having a look and I am glad you like it! The original intention was to release this as a Firefox Add-On but that would have been a hassle, not to mention limiting, compared to way it’s done now. So thanks again for your original Smashing article! Yes I have received similar feedback from others and I’m definitely considering this, probably by making the info box movable. Good point regarding the cursor, too! Ps. I will get back to the other comments above once we get through the silly season. Wirify and the problem of wireframes without content for more. Also, here are my replies to the earlier comments above. Nikos: Also i would like to suggest making your promotional window a little more flexible so that it doesn’t messes up with the wireframe when making a screen capture. I hear you guys, see my response to Tommy above. I will certainly look into this. Nikos: However it seems that it doesn’t work correctly in IE 8 and win 7. Nikos: Finally i would like to make a suggestion for future releases. It would be nice to be able to turn on and off the HTML elements on the wireframe. Do you mean controlling which HTML elements (e.g. P, IMG, SPAN) to include in the wireframe? It’s an interesting idea but I’m afraid it would complicate the interface unnecessarily. I’m more inclined to something akin to the level of detail control shown in the second video above. As an aside, you may have noticed that hovering over any of the elements in the wireframe displays the underlying HTML element type in a tooltip. So essentially label or number each level and explain what’s shown when it’s selected? That’s a very good point, I’ll have a think about it. Thanks heaps for your feedback everyone! Feel free to add yours below if you like. I love love love that you made a nice tool, based on my meager works at web.without.words. Part of my process on that site was to “breakdown” the site when viewed without content – which hopefully gives more insight into what I consider the most lacking and most important part of design (web or otherwise) and that is hierarchy. I’m almost tempted to use your tool and just post my critiques and reviews, which is to say, this is really awesome. Great job! Paul: I love love love that you made a nice tool, based on my meager works at web.without.words. Part of my process on that site was to “breakdown” the site when viewed without content – which hopefully gives more insight into what I consider the most lacking and most important part of design (web or otherwise) and that is hierarchy. I’m almost tempted to use your tool and just post my critiques and reviews, which is to say, this is really awesome. Great job! Hey Paul, that’s awesome feedback, thank you so much! Wirify would not exist today if it wasn’t for web.without.words. That’s a great way of explaining why viewing pages this way is useful, too. It’s important to keep in mind that Wirify is just a tool and it will not do the analysis for you. I would strongly encourage everyone – especially those who are critical of the concept – to check out your work at Web Without Words and the way you review and discuss the reconstructed version of the page. I personally like the aesthetics of your wireframes better with the higher contrast and coloured accents. Wirify is all grayscale intentionally though, in part to have that “traditional” wireframe look but also to be more impartial to the different element types (as colour implies importance). Please view a Chinese translation of this page using Google Translate. Hope this helps! I would like a coding system or something to be able distinguish at a glance between e.g. images v. advertisement without hovering – I would want to print out the wireframe via a screengrab and find myself having to guess at the moment. The advertisment is cool but much too large in its current location, obscuring parts of the wireframe itself. I have no problem with the presence of it. The accuracy is fairly good but could use certainly use some improvement. We have just released an update to Wirify – you can now move the information overlay and Wirify runs better on Opera and Internet Explorer. Read Wirify January update for details. Noel: I would like a coding system or something to be able distinguish at a glance between e.g. images v. advertisement without hovering – I would want to print out the wireframe via a screengrab and find myself having to guess at the moment. Hi Noel, that’s an interesting idea. Do you mean showing normal images and interactive elements like Flash differently? This should be possible to do, I’ll have a think about it. Noel: The advertisment is cool but much too large in its current location, obscuring parts of the wireframe itself. I have no problem with the presence of it. The information overlay can be moved around in the latest version of Wirify, I hope that helps. Noel: The accuracy is fairly good but could use certainly use some improvement. Yes, this is a known issue. In a way this is a good thing though, as the created wireframe is indicative only. 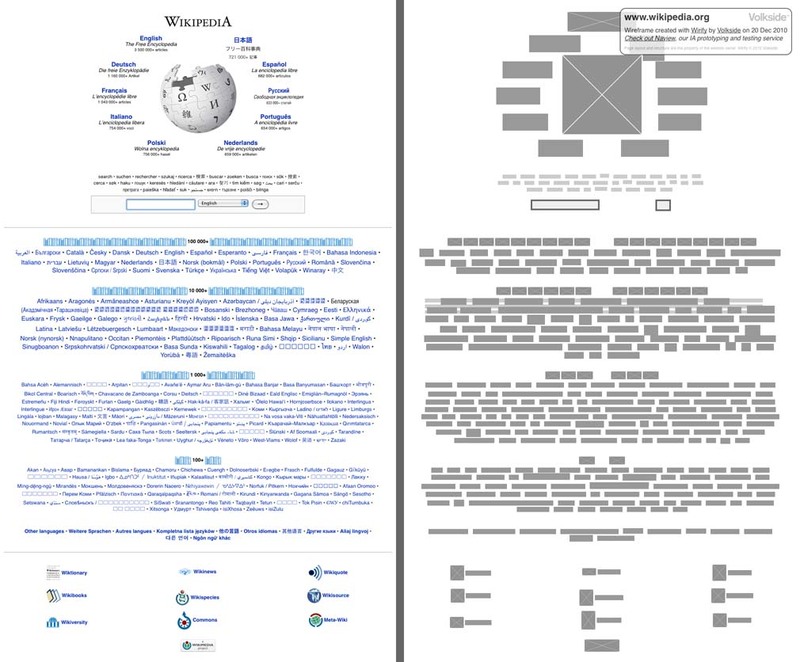 It should be sufficient for high-level analysis of the page structure and perhaps as a starting point for a redesign, however it should never be a project deliverable or replace an actual, designed wireframe. Loving this tool. Any idea if there might be a way to export/import these wireframes into Balsamiq or another prototyping/wireframe tool? In one of your youtube videos you adjust the level of detail which starts to show original elements within the wireframes, but my version of Wirify 1.2.1 doesnt seem to have this. Was it removed? Vin: Loving this tool. Any idea if there might be a way to export/import these wireframes into Balsamiq or another prototyping/wireframe tool? Thanks Vin! There are no plans for export functionality at this stage, however we may consider it if there’s enough interest. That would most likely be a separate commercial version of Wirify though. Vin:In one of your youtube videos you adjust the level of detail which starts to show original elements within the wireframes, but my version of Wirify 1.2.1 doesnt seem to have this. Was it removed? That slider was actually just a mockup version and never made it to Wirify. As briefly mentioned in the January update post I’ve decided not to include the wireframe level of detail control at this stage as it could compromise the simplicity of the tool. This is quickly becoming one of my favorite tools. Love it, thank you for making such an easy-to-use tool! Wirify is very nice, would really like to export the content in to a customizable format. Would be great for developing A/B tests of landing pages and products pages. At least that’s what I’d use it for this second. Good deal, certainly needs to the ability to modify the output. Great tool! I teach wireframing at the Art Institute and it’s really helpful to have a tool that can show students in real time what a site looks like behind the scenes! Ive been doing wireframing on complex website and I love how I can grab some sample websites, wireframe it as a starting block. KODOS! Brief update: We are currently working on export capability for Wirify, read full details in our latest blog post: Preview: Exporting Wirify wireframes to OmniGraffle. We have also released an update to Wirify with better rendering of overflow elements. Hi Annette, thank you for your kind words! Michael, please see announcement above, I hope that’s close to what you were thinking. John, thanks, that’s great to hear! I always thought Wirify would be useful for teaching and learning, and your comment certainly supports that. Carey, I’m glad you’re finding the tool useful, cheers! awesome! very usefull and thanks and keep the good work. Cool concept but needs some work. Ran it on a couple of my sites and wasn’t so hot. Ran it on Yahoo and it was better but still not what I was hoping.